One of the things I really like about London is that the immigrant population over the many years has led it having a really good cross section of ethnic restaurants, many of which are quite good. 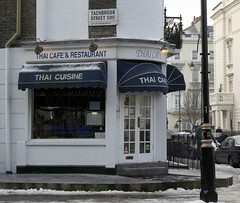 One place that I’ve been meaning to try for quite a few years is Thai Cafe, since (a) I don’t get a lot of Thai Food back home (I have to drive to Montpelier or Concord to find decent Thai food), and (b) it’s pretty much right across the street from my brother’s flat. It also gets rather good ratings. So on our first day in London, both my brother and his wife had to work, so we were on our own for wandering about the city. 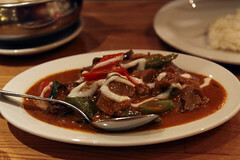 After a somewhat jet-lagged-dazed trip of shopping on Oxford street, we decided that it was time to head back to Pimlico and have a nice, relaxing dinner of Thai food. I’m glad we did. 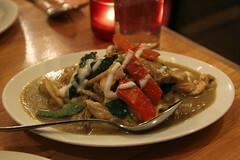 Thai Cafe is a nice little spot, having a very thorough menu of Thai noodle dishes and curries. Having a soft spot for Thai curries ourselves, both of us opted to try some of the “dry” curries (with the thicker sauces instead of the soupier ones), myself trying the Paneng Kiew Wan (dry green curry with chicken) and Carol trying the Paneng Ped (dry red curry with duck). Both dishes were quite good. My Paneng Kiew Wan had some nicely simmered chicken slices, and was served up in a thick, rich green curry that had a really pleasant peppery note, along with really strong thai basil and coconut milk notes rounding it out. Definitely the sort of curry I was craving. Carol’s Paneng Ped was similarly good: a bit less sweet and slightly less peppery, it complemented the duck well without overwhelming it. We’re rather pleased we tried this spot: Pimlico doesn’t get a whole lot of foot traffic as London neighborhoods go (aside from the tourists from Victoria station staying in the various Belgrade Road mini-hotels), and as such doesn’t always have the selection of some of the other parts of town, but Thai Cafe is definitely going to remain a go-to place for me when I’m in town. Just got takeaway there tonight. Standards are being upheld.